Listen to "#AskGaryVee: One Entrepreneur's Take on Leadership, Social Media, and Self-Awareness" on your iOS and Android device. Narrators include: Gary Vaynerchuk, Jack Welch, Dave Ramsey, Seth Godin, Kevin Jonas, Casey Neistat, Draymond Green, Alex De Simone, Adam Braun, Adam Grant, AJ Vaynerchuk, Al Harrington, Alan Belcher, Alexis O'Hanian, Andrew Greif, Andy Dunn, Andy Krainak, Benjamin Lazarus, Beth Comstock, Black Coffee, Brittany Hoffman, Charlie Ebersol, Chase Jarvis, Chef Lizette, Cristie Kerr, Dana Anderson, Dawn Swick-Renshaw, Dennis Crowley, Dustin Keller, Erik Dellenback, Greg Pesci, India Kieser, Jack Haber, Jason Calacanis, Jason Farris, Jason Fried, John Legend, Justin Brooke, Kevin Asp, Leo LaPorte, Leslie Blodgett, Mike Vacanti, Peter Brown, Phil Rosenthal, Phillip Gimmi, Ross Walker, Scott Wyden, Sean Burrows, Shonduras, Soren Azorian, Staphon Lawrence, Steph Ruhle, Steve Sadove, Steve Unwin, Dr. Thiago Moraes, Tim Evans, Tom Ferry, Troy Carter, Warren Weeks, Zak Moy, Matt DeMayo, Nathan Scherotter. **STOP** push the back screen button and search for Gary Vee's "Jab Jab Jab, Right Hook" and start there. Thought about 4 starts for a second or two. This is literally 11 hours of asking Gary (successful author, entrepreneur and social medial mogul) about everything from football to venture capitalism. I recommend that you start at the beginning with Gary. It will give you better appreciation and perspective for this book. Was it worth the listen? Yes Engaging? Yes Entertaining? Yes Informative? Yes Would I recommend it to others? Sure (after they tackle book one) Impact? Modest Life Changing? Less than Modest Does it give the secret to unlocking unforetold wealth and prowess? Sorry (must have been in the first or second book) Will I refer back to it occasionally? Probably Not Would I listen to it again? Maybe.... nah, probably not Can you listen to this at 1.25X speed? Yes Can you listen to this at 2x speed? NOOOOO Rated - Audio-MA (Language mostly PG with a handful of F bombs and more frequent scatological terms) I snagged this audio book while standing in line to board a plane. I landed on "Ask Gary Vee" because of average rating by consumer. I will admit, I was a little confused at first by the book progression (which was literally 11 hours of people asking questions.... should have guessed by the title) but was quick to get into the rhythm. I hadn't heard of Gary previously and frankly I wished I had some context before the launch into How Gary? What Gary? Who stole first Gary? Once you get into the meat of the conversation you will get the point. Am I intrigued to buy his other book(s)? Sure.... What was the take-away? 1) Even early failures can result in big success. School failure doesn't mean life failure 2) Start your own Media company... yes you, even the girl that makes thumb puppets 3) Gary is going to own the New York Jets (one day) even though they have a poor performance history 4) It takes time, persistence and consistency 5) EQ is more important than IQ 6) Stop restricting your kids electronic time..... its the future duh... do you want to hurt your kids future? 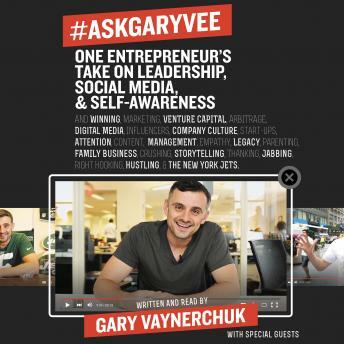 7) Confidence, Confidence and more Confidence 8) Don't ask Gary for participation trophies There you have it, a glimpse into 11 hours of Gary V's personal narration of the book #askgaryvee. Gary Vee does it again with his suede on one side and iron on the other side hammer. I love his conviction, passion and confidence even when you agree to disagree. Book reads more like a live pod cast. Lots of Q and A with very little meat. This is my first time digesting any of Gary's material and I honestly don't get the hype. I would not recommend. It wasn't for me, I had to stop 3 hours into it.